Neuroimmunol Neuroinflammation 2019;6:5.10.20517/2347-8659.2018.70© The Author(s) 2019. Department of Molecular Biology and Genetics, Faculty of Science, Mugla Sitki Kocman University, Kotekli, Mentese, Mugla 48000, Turkey. Spinal cord injury (SCI) can be defined as an endogenous or exogenous trauma resulting in the loss of motor, autonomic, sensory and/or reflex functions. SCI is a major cause of permanent disability. Researchers estimate that 230,000 people in the United States are living with an SCI, and that 10,000 new patients are diagnosed each year[1-7]. The pathology of human spinal cord injury is the result of two main mechanisms known as “primary” and “secondary” injury. Primary injury begins at the moment of trauma and is characterized by hemorrhage and rapid cell death. Secondary injury is an extension of the original injury and occurs when vascular and biochemical effects cause tissue loss and functional disorders[8,9]. It is important to state that primary injury always serves as the nidus of secondary injury. Secondary injury mechanisms primarily involve neurogenic shock, vascular damage, ischemia and hemorrhage, immunologic secondary injury, glutamate excitotoxicity and subsequent apoptosis. Among all, the most destructive cellular mechanism underlying secondary injury is glutamate excitotoxicity, which overactivates calpain protease via excessive Ca2+ influx and induces neuronal apoptosis via p53 induction. Furthermore, intracellular Ca2+ influx has an apoptotic effect, particularly through p53 induction on mitogenic extracellular signal-regulated kinase/mitogen-activated protein kinase (ERK/MAPK) and survival phosphoinositide 3-kinase/protein kinase B (PI3K/AKT) pathways. Therefore, a primary goal of SCI treatment could involve the prevention p53-induced apoptosis caused by glutamate excitotoxicity. Speedy/rapid inducer of G2/M progression in oocytes (Speedy/RINGO) is a cell cycle regulatory protein that increases survival of p53-positive mitotic cells by inhibiting the apoptotic machinery. Moreover, this protein elicits p53-dependent anti-apoptotic effects on calpain-induced degenerating primary hippocampal neurons, amyotrophic lateral sclerosis (ALS) motor neurons and in astrocytes and microglia in spinal cord lesions. In addition, evidence from breast and testis cancer studies strongly implicates the direct or indirect interaction of Speedy/RINGO as a p53-dependent anti-apoptotic factor for ERK/MAPK and PI3K/AKT pathways[16-18]. These findings strongly suggest a role for Speedy/RINGO as a shield against p53-mediated apoptotic death in SCI. As yet, there is not any proven treatment regimen for SCI probably due to its lesser known pathophysiology. Revealing cellular mechanisms of SCI and correlating them with the clinical symptoms are of primary importance for developing effective SCI recovery treatments. In this regard, this review focuses on the underlying molecular mechanisms of Speedy/RINGO’s anti-apoptotic function by correlating these mechanisms with the complex pathophysiology of SCI. Furthermore, this review discusses how this protective function could possibly be exploited to facilitate recovery from SCI. Particular attention is paid to reversal of the negative effects on the ERK/MAPK and PI3K/AKT pathways via induction of p53. This new approach may assist in identifying the most promising molecular targets for effective treatment modalities and may also uncover the molecular basis of SCI. Excitotoxicity is defined as cell damage or cell death resulting from exposure to excitatory amino acids such as glutamate. Glutamate is a major neurotransmitter that plays an important role in the central nervous system. After spinal cord injury, glutamate levels increase in and around the trauma site. As a result of glutamate release, glutamatergic activity contributes to induction and progression of secondary injury in SCI. When an excessive amount of glutamate is released from presynaptic nerve terminals and from astrocytes into the extracellular space, glutamate receptors (N-methyl-d-aspartate receptor, α-amino-3-hydroxy-5-methyl-4-isoxazole propionate receptor) are over stimulated. Glutamate excitotoxicity leads to Ca2+ imbalance, free radical formation, and apoptosis. An excessive amount of Ca2+ influx into the cell is neurotoxic because it causes the activation of certain enzymes such as calpain protease that degrade cellular proteins and membranes[21,22], leading to p53-mediated apoptosis[10,23][Figure 1]. Ionic balance is essential to protecting the functional integrity of neural cells. Therefore, Ca2+ imbalance provides a mechanism for a severe secondary injury. The influx of Ca2+ is triggered by trauma through glutamate toxicity and continues for some time once it has been triggered. Ca2+ influx has serious negative effects in neural cells, including mitochondrial damage that further destabilizes Ca2+ balance, generation of free radicals, and activation of many enzymes, including calpain. This ultimately triggers degradation of cellular components, leading to p53 induction and subsequent caspase-dependent apoptosis[24,25] and the spread of the axoplasmic damage into adjacent cells[26,27]. One therapeutic strategy to reduce the degree of secondary damage in the neural pathways of SCI patients would be the inhibition of the apoptotic downstream effects of Ca2+ influx. Programmed cell signaling pathways play an important role in the pathobiology of neurological diseases such as SCI. After spinal cord trauma, a number of cells at the lesion site die via apoptosis or necrosis. Apoptosis is a programmed cell suicide mechanism which can be triggered by cytokines, post traumatic inflammation, free radicals and excitotoxicity. Recent studies confirm that cells of injured spinal cord tissue primarily die due to apoptosis. Apoptosis is commonly observed in both neurons and oligodendrocytes, increasing the possibility of paralysis in patients with SCI. An experimental study in rats showed that apoptosis occurred 4 h after trauma, and that the effect of the injury could be decreased as late as 3 weeks after SCI. A caspase mechanism is activated in neurons at the injury site and spreads to adjacent and distant oligodendrocytes. Thus, the primary injury caused by spinal cord trauma progresses into nearby tissue cells, leading to secondary injury. In SCI, increased intracellular Ca2+ influx as a result of glutamate induction is one of the major apoptotic insults leading to overactivation of certain proteases which subsequently cause proteolytic degradation of myelin and cytoskeletal proteins and degeneration of axons. These are all hallmarks of secondary injury and contribute to the progression of SCI[30-34]. One of these proteases - calpain - is known to be a highly effective neurodegenerator. Upon its overactivation, calpain increases p53 and caspase-3 activation, causing neurons to degenerate through apoptosis. In addition, calpain overactivity has been shown to disrupt the regulation of mitogenic ERK/MAPK and survival PI3K/AKT signaling cascades in a p53-dependent manner. Based upon these findings, it is evident that glutamate-mediated p53 induction is the prominent reason for apoptosis in SCI. The p53-dependent anti-apoptotic function of Speedy/RINGO makes it an excellent therapeutic candidate for treatment of SCI. Current research approaches for developing novel therapeutic regimens target both primary and secondary injuries, which are the hallmarks of SCI. Since more complex, multifaceted neurodegenerative progression occurs in secondary injury, the main aim of such investigations is to understand the underlying molecular mechanisms and find the potential key molecules to target for effective SCI treatment. Since the complex molecular mechanisms of SCI have only been partially elucidated, most efforts so far have had limited efficacy. These efforts mainly involve providing anti-neuro-inflammatory conditions[30,35-37] preventing excitotoxicity in neurons[38,39], reducing oxidative damage[31,40,41] and regulating the effects of intracellular ionic changes, such as altered Ca2+ homeostasis. Spinal cord injury results in loss of oligodendrocytes which, in turn, causes demyelination of axons. Since demyelination largely impedes functional recovery from SCI, an important treatment modality involves preventing oligodendrocytic death and/or enhancing myelin formation by regulating myelin-related factors such as Nogo, ephrins, semaphorins, oligodendrocyte-myelin glycoprotein, and/or myelin-associated glycoprotein, all of which have been shown to increase neuroregeneration after spinal cord injury[43-49]. Neurotrophins and neurotrophin receptors are reported to provide neuronal survival[43,50-55] and enhance behavioral recovery in SCI[56-58], so another potential treatment strategy would be to enhance the expression of regeneration-associated genes such as neurotrophins, integrins, GAP-43 and CAP-23. In addition to genetic and molecular-based studies, some researchers are studying the efficacy of transplanting stem cells, Schwann cells, peripheral blood stem cells and bone marrow to replace lost tissue[57,59,60]. Numerous studies on spinal cord injury in rodents, primates and humans have indicated that the level of inflammation increases as a result of glial cell activation and filtration of somatic immune cells through mechanically disrupted spinal cord tissue. The effect of inflammation in the secondary mechanism of SCI has not yet been clarified. However, it is known that inflammation induces astrocytic gliosis. This, in turn, results in glial scar formation, spread of the inflammatory response and damage to the surrounding healthy neurons, leading to their apoptotic deaths. In a study aiming to prevent astrocytic gliosis, researchers focused on the role of the mitogenic ERK/MAPK signaling cascade in astrocytic proliferation, since mitosis is the most important feature of reactive astrocytes. In their experiments, an increase in expression and phosphorylation of ERK/MAPK members was observed in reactive proliferating astrocytes of SCI lesions. In order to downregulate ERK/MAPK signaling, liposomes containing the interferon-β (IFN-β) gene were administered 30 min after injury. After 14 days, the ERK/MAPK phosphorylation and proliferation rates were significantly reduced. The animals that received the IFN-β gene exhibited neurobehavioral recovery, indicating the importance of regulating mitogenic ERK/MAPK signaling in SCI. In addition to ERK/MAPK signaling, the other component responsible for this astrocytic proliferation was shown to be the mitotic regulator Speedy/RINGO. Researchers indicated that 2 days after SCI, Speedy/RINGO expression peaked specifically in astrocytes and microglia cells in concordance with the increase in their proliferation rate. This finding points to Speedy/RINGO as another strong candidate to prevent astrocytic proliferation. Findings of these studies on astrocytic gliosis indicate that the interaction between Speedy/RINGO upregulation and ERK/MAPK hyper-phosphorylation leads to glial scar formation [Figure 2]. Glial scar formation is one of the primary obstacles for axon regeneration after injury. Therefore, an effective treatment strategy for SCI may involve preventing expansion of these scars by targeting Speedy/RINGO, and thereby affecting ERK/MAPK signaling and allowing axonal regeneration. Apart from the research studies on astrocytic gliosis, other experiments showed that, in SCI, the intraneuronal Ca2+ level increases as a result of glutamate induction. Consequent deregulation of Ca2+ homeostasis leads to abnormal activation of proteases, which subsequently cause proteolytic cleavage and degradation of myelin and cytoskeletal proteins, along with degeneration of axons. These are all hallmarks of secondary injury that contribute greatly to the progression of SCI[30-34]. As previously mentioned, one of these proteases, calpain, experimentally induces apoptosis in degenerating neurons through increasing p53 and caspase-3 activation. Furthermore, there is strong evidence indicating that intracellular Ca2+ influx gives rise to apoptotic deregulation of mitogenic ERK/MAPK and survival PI3K/AKT pathways through p53 induction. In certain neurodegenerative conditions, MAPK and PI3K/AKT signaling pathways provide a crucial function in neuronal survival[10,23,64]. In one in vivo study, researchers performed facial nerve axotomy on rats to create a peripheral nerve injury model. They then analyzed the ERK/MAPK and PI3K/AKT pathways by evaluating the phopshorylation levels of ERK and AKT in axotomized neurons. Seven days after the nerve axotomy, ERK and AKT phosphorylation levels were shown to have increased, while the rate of apoptosis was shown to have decreased. These researchers also used the MAPK inhibitor or PI3K/AKT phosphorylation inhibitor to determine survival rate of facial neurons, regenerated axon number and length of regenerated axons, in the event that ERK/MAPK and PI3K/AKT signaling cascades were silenced. When ERK phosphorylation was inhibited, only the regenerated axon length was obviously decreased. However, inhibition of AKT phosphorylation significantly reduced not only the length of regenerated axons but also the number of new axons and the survival rate of neurons. Results of this study clearly indicate that nerve injury through axotomy activated both PI3K/AKT and ERK/MAPK signaling in neurons, implying an effort to survive. In another in vitro study investigating the function of ERK/MAPK and PI3K/AKT pathways in neuronal survival after injury, researchers demonstrated that ciliary neurotrophic factor (CNTF) promotes survival and process outgrowth via ERK/MAPK and PI3K/AKT pathways in oxytocinergic neurons of hypothalamic organotypic cultures. Finally, a research group performed an in vitro study to analyze the role of MAPK signaling in preventing cytosine arabinoside (araC)-induced apoptosis in sympathetic neurons. They induced apoptosis with araC and used the selective MAPK inhibitor PD98059 to test whether MAPK inhibition affected the rate of apoptosis. Their results showed that MAPK inhibition increased the rate of araC-induced apoptosis in the presence of nerve growth factor (NGF) in a p53-dependent manner. This finding indicated that the MAPK signaling pathway plays a critical role in protecting primary neurons against apoptosis under certain pathological conditions. The aforementioned studies dealing with neurons and astrocytes demonstrate the controllable nature of ERK/MAPK and PI3K/AKT pathways through different effector molecules, including p53, NGF, CNTF and, most probably, Speedy/RINGO. This implies that properly balancing the activity of these pathways with respect to different neuropathological conditions and different cell types may help prevent neurodegeneration and apoptosis. To recapitulate, deregulation of intraneuronal Ca2+ influx - which is one of the well-known triggering events of secondary injury in SCI - results in activation of calpain. This activation subsequently increases p53 levels, which abnormally regulate MAPK and PI3K/AKT pathways and lead to severe neurodegeneration and apoptotic death. A number of investigations have studied whether the reduction of apoptotic effects of Ca2+ influx can prevent or minimize secondary injury in SCI. Estrogen is one inhibitor that has been used to protect cells in culture and in rat models against apoptosis. Researchers showed that estrogen and its analogs decreased the activity of calpain protease and inhibited apoptosis in microglia, neurons and oligodendrocytes. Melatonin, known for its antioxidant and anti-inflammatory properties, is another anti-apoptotic agent in SCI. It has been shown that melatonin promotes neuronal survival by preventing secondary injury through free oxygen radical scavenging[57,58]. Melatonin also works to alleviate intracellular Ca2+ influx and subsequent calpain activation[65-70]. Abnormal intracellular Ca2+ influx, as an integral part of SCI, has apoptotic effects such as aberrant regulation of MAPK and AKT signaling pathways via p53 induction. Because of this, it is vital to overcome, or at least minimize, this apoptotic effect of Ca2+ and provide neuroprotection to neurons at the injury site. In order to achieve this goal, the first challenge is to thoroughly understand the exact pro-apoptotic mechanisms driven by Ca2+ influx and the key factors involved in these mechanisms. From this point of view, superior neuronal protection in SCI involves a two-pronged approach: (1) reversal of the apoptotic effect on injured neurons caused by the apoptotic deregulation of the ERK/MAPK and PI3K/AKT pathways; and (2) inhibition of pathological calpain protease activation. The goal of our laboratory is to understand the pro-apoptotic mechanism of Ca2+ deregulation and to prevent apoptosis by inhibiting the downstream effects of lethal Ca2+ influx in neurons. To this effect, we are studying the novel cell cycle regulatory protein Speedy/RINGO due to its p53-dependent anti-apoptotic function which has previously been observed in U2OS osteosarcoma cells, calpain-induced degenerating primary neurons, ALS motor neurons and astrocytes and microglia of spinal cord lesions. The main function of Speedy/RINGO is the regulation of the cell cycle in mitotic cells. However, recent studies show that Speedy/RINGO also has an anti-apoptotic effect in DNA-damaged mitotic cells, allowing for their survival. Speedy/RINGO has been shown to have a strong protective effect for mitotic cells exposed to extrinsic or intrinsic apoptotic factors such as UV irradiation. This anti-apoptotic function of Speedy/RINGO has also been utilized and confirmed in post-mitotic degenerating primary neurons and in ALS motor neurons. Speedy/RINGO performs this function by inhibiting caspase-3 activation and apoptosis in the presence of the gene regulatory protein p53[12,13]. Since p53-mediated apoptosis is inevitable for SCI patients, utilizing Speedy/RINGO’s anti-apoptotic feature may turn the tide in the battle against SCI. In eukaryotic cells, cell cycle progress is strictly controlled by cyclin-dependent kinases (CDKs) which are regulated by cyclins. Cyclins regulate CDK activity during different phases of the cell cycle by binding and phosphorylating them. Although cyclins are the key regulators of CDK activity, Speedy/RINGO, a novel cell cycle regulator, is shown to bind and regulate CDK activity in many eukaryotic cell types. Speedy/RINGO was first identified in Xenopus oocytes as a meiotic cell cycle regulator accelerating G2/M progression during oocyte maturation. Unlike cyclins, Speedy/RINGO binds and activates CDKs by a yet unelucidated phosphorylation-free mechanism. There are at least three major branches in the Speedy/RINGO family (A, B and C), with a fourth branch (D) suspected. Speedy/RINGO A, the human homologue Spy1, is the most conserved and the most slowly evolving branch of Speedy/RINGO family. This is the branch used in our laboratory. Branch A is found in nearly all types of cells in fish, chickens, sea urchins and mammals. Expression levels are higher in testis tissue than in tissues such as brain, heart, lung, placenta, prostate, small intestine, etc.. Since Speedy/RINGO is primarily a mitosis regulatory protein, it is not widely expressed in post-mitotic neurons. Although the main function of Speedy/RINGO is cell cycle regulation, studies have attributed a p53-dependent anti-apoptotic function to Speedy/RINGO in DNA-damaged mitotic cells, resulting in those cells evading apoptosis and, thus, surviving. When apoptotic insult occurs during a cell cycle, the resulting DNA damage triggers cell cycle arrest. This arrest, in turn, activates checkpoint responses to allow cells to repair the DNA damage. Increased expression and activation of p53 is the key event in these responses. In the event that irreparable DNA damage occurs, cells activate their apoptotic machinery, ultimately leading to cell death. Speedy/RINGO has been shown to prevent p53-dependent apoptosis which is normally induced in response to DNA damage in a mitotic human osteosarcoma cell line, U2OS. The survival effect of Speedy/RINGO on mitotic cells was very strong and significant against a number of extrinsic or intrinsic apoptotic factors (e.g., carcinogenic-level UV irradiation). Speedy/RINGO helps cells evade apoptosis by inhibiting caspase-3 activation only in the presence of the gene regulatory protein p53[12,75]. Although there are intrinsic regulatory mechanisms for calcium influx into neurons, a number of insults such as glutamate neurotoxicity cause deregulation of calcium homeostasis by increasing intraneuronal calcium influx, as in SCI. This increase in calcium influx induces cystein proteases, including calpain, and results in pathologic calpain activation. 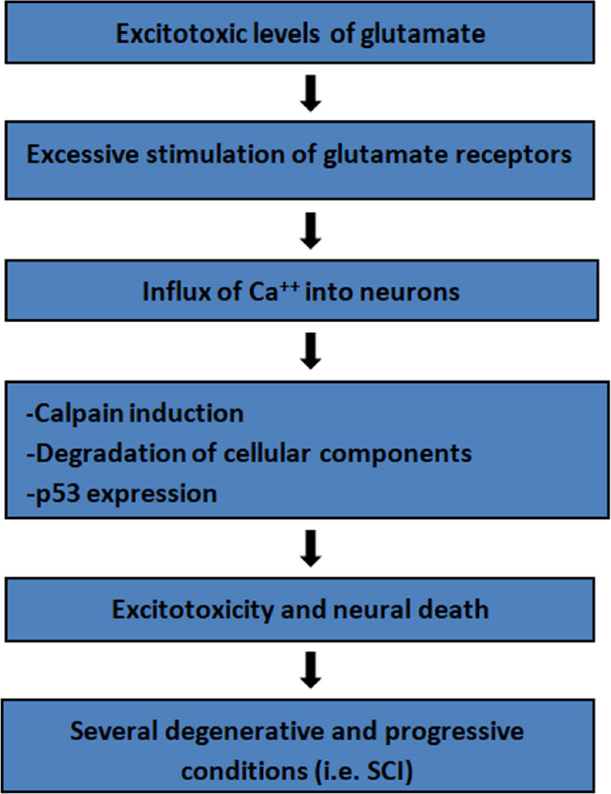 Pathological activation of calpain is known to be one of the most important neurodegenerative factors triggering apoptosis, which it does by inducing p53 and activating caspase-3. Calpain overactivation directly or indirectly induces p53 expression and drives neurons into apoptosis. Indirectly, overactivated calpain cleaves p35 protein into p25 and p10 fractions. Under normal conditions, p35 is the partner for non-mitotic neuron-specific kinase cdk5, forming a cdk5/p35 complex. This complex functions in important cellular events such as neuronal development and maturation[76-78]. When neuronal calpain is overactivated as a result of increased Ca2+ influx, however, p35 is cleaved by calpain into p25 and p10 fractions. Like p35, p25 can bind to cdk5, forming a cdk5/p25 complex. However, cdk5/p35 and cdk5/p25 complexes differ in both localization and function. The cdk5/p25 complex has been shown to directly activate p53, with p53 acting as a substrate for cdk5. Data indicate that the calcium-mediated calpain activation observed in SCI results in an increase in p53 expression and activation, leading to caspase-dependent apoptosis and the resulting degeneration of neurons. Calpain overactivation leads to increased p53 expression and activation which, in turn, triggers caspase-mediated apoptosis of neurons. Apparently, both direct and indirect calpain-induced apoptosis occur in a p53-dependent fashion. In addition to its cell cycle regulatory function, Speedy/RINGO has also been shown to function in preventing apoptosis by inhibiting caspase-3 activation in a p53-dependent manner in mitotic U2OS cells. Since Speedy/RINGO is primarily a cell cycle regulatory protein, it is highly expressed in mitotic cells compared to post-mitotic cells such as neurons. One possible way to prevent p53 mediated apoptosis in neurons would be to transfect non-mitotic neurons with Speedy/RINGO. With this in mind, our laboratory designed an in vitro experiment utilizing primary hippocampal neurons from post-natal (PN0) Sprague-Dawley rats. These neurons were transfected with Speedy/RINGO. After transfection, calpain was induced using calcium ionophore A23187, facilitating extracellular Ca2+ transport into the neurons. Results of our study showed for the first time that Speedy/RINGO, a mitotic cell-specific protein, is protective against p53-mediated apoptosis in non-mitotic neurons. Calpain induction by A23187 was shown to drive neurons into apoptosis by increasing p53 expression and activating caspase-3, which is a typical characteristic of caspase-dependent apoptosis. However, overexpression of Speedy/RINGO in calpain-induced neurons prevented caspase-3 activation in a p53-dependent manner. In another recent study, Speedy/RINGO expression levels were shown to substantially decreased in ALS motor neurons compared with wild-type controls. As a result of decreased Speedy/RINGO expression, reduction in cell viability and activation of the DNA damage response in SOD1 mutated cells was established. Conversely, increased Speedy/RINGO expression enhanced cell viability and prevented the DNA damage response in SOD1 mutated cells. These findings indicate that Speedy/RINGO confers a similar protective benefit for both ALS motor neurons and degenerating primary hippocampal neurons. It is therefore possible that Speedy/RINGO may someday play a role in treating neurodegenerative conditions such as SCI. Even though the exact mechanism for the protective role of Speedy/RINGO in p53-mediated apoptosis requires further analysis, the effects are not due to the direct inhibition of calpain activity or p53 induction, as calpain-mediated p53 induction was maintained even in the presence of Speedy/RINGO. The mechanism may instead occur downstream from the p53 activation. In addition to the aforementioned studies on degenerating primary neurons and ALS motor neurons, results of carcinogenic[16-18] and astrocytic[15,63] proliferation studies point out that, among the downstream targets of p53, ERK/MAPK and PI3K/AKT, signaling cascades are the most potent in terms of clarifying the p53-dependent anti-apoptotic mechanism of Speedy/RINGO. p53 is a tumor suppressive transcription factor that inhibits tumorigenesis under genotoxic conditions by regulating gene expression. p53 induces anti-tumorigenesis mechanisms - including cell cycle arrest, senescence and apoptosis - according to cellular conditions, type and intensity of stress signals[82-84]. Similarly, the regulation of apoptosis, cell cycle arrest and proliferation by the ERK/MAPK pathway differs depending on the type of stress signals received and the context of the cell[85,86]. Under stress conditions, different signaling pathways can be triggered. For example, p38[87-89] and ERK/MAPK[90-93] activate p53 and induce its transcriptional activity. The reverse also occurs: p53 may activate ERK/MAPK signaling[85,94,95] by inducing tyrosine kinase receptor DDR1. In addition, p53 is also capable of suppressing the ERK/MAPK pathway via activation of various phosphatases. These phosphatases then dephosphorylate ERK and inhibit its anti-apoptotic function, leading to p53-dependent apoptosis[97,98]. It is evident that interaction between p53 and ERK/MAPK signaling differs depending on cellular context and the type of stress stimulus. Another p53-related signaling pathway is PI3K/AKT. P13K/AKT has primarily been implicated in promoting cell survival in response to extracellular signals[99-101] that regulate intracellular signaling cascade by activating transmembrane receptors. This activation recruits PI3K isoforms to the plasma membrane which, in turn, results in phosphorylation and activation of AKT. Activated AKT has a number of cell survival stimulating effects through phosphorylation and inhibition of pro-apoptotic genes. There is growing body of evidence indicating a negative regulatory function for p53 on cell survival in healthy cells. In this mechanism, p53 binds to the promoter site of PTEN (a phosphatase and tensin homolog deleted on chromosome ten)[102,103]. Active PTEN dephosphorylates the 3’ phosphate of phosphoinositol triphosphate which results in the inhibition of the PI3K/AKT pathway. This inhibition subsequently causes a reduction in phospho-AKT levels, which has been shown to cause G1 arrest in glioblastoma cells, but trigger apoptosis in carcinomas[104,105]. In addition, p53 induction causes significant inhibition of PI3K/AKT in EB1 colon cancer cells which strongly implies that inhibition of PI3K/AKT is essential for p53-dependent apoptosis. These two pathways have been shown to be equally important for neuronal survival and regeneration after nerve injury. Researchers found that 7 days after axotomy, ERK/MAPK and PI3K/AKT signaling activity was increased, causing reduced apoptosis. Thus, it is reasonable to assume that the inhibitory effect of increased p53 levels on the ERK/MAPK and PI3K/AKT pathways may be the major death signal for neurons in SCI. Evidently, ERK/MAPK and PI3K/AKT signaling is very important for cell survival. Depending on the cellular context, cell type, and internal/external stimuli, however, p53 may act as a strong anti-apoptotic or pro-apoptotic regulator of both pathways. Previous investigations by our lab indicate that Speedy/RINGO protects neurons against calpain-mediated p53-dependent apoptosis without decreasing p53 levels. This finding strongly implies that the anti-apoptotic effect of Speedy/RINGO is downstream of p53 activation, not directly on calpain or p53 itself. As explained above, the most remarkable downstream targets of p53, in terms of generating an apoptotic effect on neurons, are ERK/MAPK and PI3K/AKT pathways. Therefore, in degenerating neurons, Speedy/RINGO may use its ability to regulate ERK/MAPK and PI3K/AKT pathways to reverse the apoptosis-triggering effect of p53 induction on these pathways [Figure 3]. Furthermore, cancer studies show promising evidence of direct or indirect interaction of Speedy/RINGO with ERK/MAP and PI3K/AKT pathways. Several studies on tumorigenesis in breast tissue show that ERK/MAPK pathway overactivation results in Speedy/RINGO overexpression. As a result of inhibition of enzyme MEK1, a member of the MAPK pathway, Speedy/RINGO expression is shown to decrease. In addition, studies using testis tissue revealed that Speedy/RINGO overexpression causes an increase in Cyclin A2-cdk2 expression. Mouse embryonic stem cell studies indicated that Cyclin A2-cdk2 complex has an important role in AKT hyperphosphorylation, which is a highly effective apoptosis-prevention factor in many types of cancer. On the other hand, studies on glial scar formation through astrocytic gliosis, a hallmark of secondary injury that inhibits axonal regeneration, show that increased Speedy/RINGO expression is one of the major events responsible for astrocytic proliferation. Since glial scar formation is a very potent inhibitor of SCI recovery, researchers are studying how to therapeutically prevent astrocytic gliosis. In one of these studies, researchers focused on the mitogenic ERK/MAPK signaling cascade in astrocytic proliferation. Their experimental results showed that ERK/MAPK phosphorylation/activation was increased in proliferating astrocytes of SCI lesions. Treating these cells with the IFN-β gene significantly reduced ERK/MAPK activity and the astrocytic proliferation rate. Findings from these studies on astrocytic gliosis imply that there may be an interaction between upregulation of Speedy/RINGO and ERK/MAPK hyper-phosphorylation leading to glial scar formation. Taking these data into consideration, it is reasonable to think that Speedy/RINGO may have reversed the inhibitory effect of p53 on ERK/MAPK and PI3K/AKT pathways, and thus prevented apoptosis in degenerating hippocampal and ALS motor neurons. Hence, it is worthwhile to further explore p53-dependent anti-apoptotic regulatory function of Speedy/RINGO on these pathways. Our laboratory is currently investigating the function of Speedy/RINGO on the ERK/MAPK and PI3K/AKT pathways using undifferentiated p53- and Speedy/RINGO-expressing neuronal-like neuroblastoma cells. Preliminary data give remarkable clues indicating that Speedy/RINGO plays an essential role on the regulation of ERK/MAPK and PI3K/AKT signaling pathways that directly affect the apoptotic state and survival rate of neuroblastoma cells. More precisely, silencing of the Speedy/RINGO gene significantly alters expression levels and phosphorylation states of certain members of the ERK/MAPK and PI3K/AKT pathways. This, in turn, leads to apoptotic death of neuroblastoma cells, likely due to the absence of Speedy/RINGO’s regulatory function on these two pathways. SCI is a critical clinical issue whose ongoing destructive path affects patients for life. It is one of the most important causes of disability and mortality around the world[106,107]. It has long been known that glutamate-induced Ca2+ influx through glutamate receptors, known as glutamate excitotoxicity, is indispensable for SCI. This influx ultimately causes the p53-mediated apoptotic death of neurons. It is most likely that p53 exerts its apoptotic function on the members of ERK/MAPK and PI3K/AKT signaling cascades. The goal of our laboratory is to elucidate and prevent the pro-apoptotic intracellular Ca2+ deregulation in neurons. We are therefore optimistic about Speedy/RINGO, a novel cell cycle regulatory protein proven to have a p53-dependent anti-apoptotic function in different cell types, including U2OS osteosarcoma cells as well as calpain-induced degenerating primary hippocampal neurons. In addition, Speedy/RINGO expression levels were shown to be substantially decreased in ALS motor neurons compared with wild-type controls. By contrast, increased Speedy/RINGO expression enhanced cell viability and prevented the DNA damage response in ALS motor neurons. These findings indicate that Speedy/RINGO plays a protective role in both ALS motor neurons and in degenerating primary hippocampal neurons. This implies a potential therapeutic role for oncogenic proteins in neurodegenerative conditions such as SCI. Although the mechanism of Speedy/RINGO’s anti-apoptotic function in degenerating neurons is not yet known, Speedy/RINGO most probably exhibits its protective function on downstream targets of p53, rather than on p53 levels directly. ERK/MAPK and PI3K/AKT survival pathways are the most important downstream targets of p53 in cases of neurodegeneration, and Speedy/RINGO has been shown to act on both pathways. This evidence has come from both cancer studies[16-18] and studies on glial scar formation in SCI. Exploring this interaction and revealing the possible regulatory function of Speedy/RINGO on these pathways may help to someday reverse the p53-induced apoptotic effect observed in SCI. Overexpressing Speedy/RINGO in in vitro and in vivo SCI models and exploring its effects will provide important insights about underlying molecular mechanisms of secondary injury. One goal is to study the abnormal regulation of ERK/MAPK and PI3K/AKT pathways by transcription factor p53, one of the primary initiators of secondary injury. As described elsewhere in this paper, we believe that Speedy/RINGO is likely to exhibit anti-apoptotic activity in the neuron and glia cells of areas affected by SCI, making this protein a strong potential candidate for therapeutic treatment of SCI patients. In order to confirm the presumed anti-apoptotic function of Speedy/RINGO in SCI, further studies should be performed with both in vivo and in vitro SCI models. It is important to remember that Speedy/RINGO’s anti-apoptotic function in neurons and astrocytes may be advantageous or disadvantageous depending on the cell type and function in SCI. 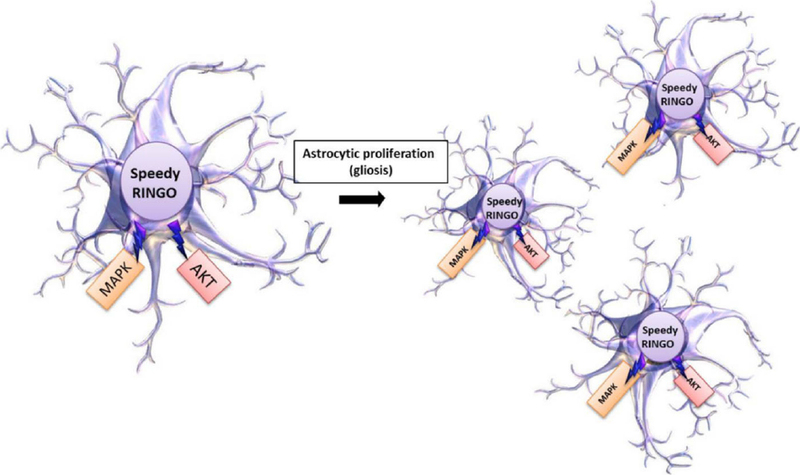 Speedy/RINGO’s anti-apoptotic function is desirable in neurons, but undesirable for astrocytes, since it causes glial scar formation and thereby prevents axonal regeneration. In developing an effective SCI recovery regimen, Speedy/RINGO will need to be regulated differentially depending on the therapeutic target. The pathophysiology of SCI has not yet been fully elucidated, making it difficult to develop effective treatment methods. Overcoming this problem will require collaboration between basic and clinical researchers. Basic research must take place to gain a clear understanding of the basic neuronal and glial mechanisms seen in SCI before these mechanisms can be linked to clinical SCI symptoms and recovery. Versatile molecules like Speedy/RINGO are an excellent tool for increasing our understanding of the molecular mechanisms of SCI with the goal of developing effective treatment strategies. We sincerely thank Prof. Arzu Karabay for her invaluable contributions as an advisor to our studies on primary hippocampal neurons. We are grateful to Prof. Daniel J. Donoghue for his generous gift of myc-tagged Speedy A-pCS3 construct for neuronal transfection studies. We also warmly thank Sharon Page for editing this paper. Studies mentioned here that were performed in our laboratory were supported by grants to Ayşegül Yıldız from Mugla Sitki Kocman University Scientific Research Project Office, Research and Development Projects (17/023), to Arzu Karabay from The Turkish Academy of Sciences Distinguished Young Scientist Award (TÜBA-GEBIP), and The Scientific and Technological Research Council of Turkey (TÜBİTAK), The Basic Sciences Research Group (TBAG) (108T811). 1. Bracken MB, Freeman DH, Hellenbrand K. Incidence of acute traumatic spinal cord injury in the United States, 1970-1977. Am J Epidemiol 1981;113:615-22. 2. Garfin SR, Shackford SR, Marshall LF, Drummond JC. Care of the multiply injured patient with cervical spine injury. Clin Orthop 1989;239:19-29. 3. Green BA, Klose JK, Goldberg ML. Clinical and research considerations in spinal cord injury. In: Becker DP, editor. Central nervous system trauma status report Washington, DC: National Institutes of Health; 1985. pp. 341-68. 4. Green BA, Magana I. Spinal injury pain. In: Long DM, editor. Current therapy in neurological surgery Philadelphia: BC Decker; 1989. pp. 294-7. 5. Woodruff BA, Baron RCA. Description of nonfatal spinal cord injury using a hospital-based registry. Am J Prev Med 1994;10:10-4. 6. Young JS, Northrup NE. Statistical information pertaining to some of the most commonly asked questions about spinal cord injury. Spinal Cord Injury Digest 1979;1:11. 7. Green BA, Eismont FJ, O’Heir JT. Pre-hospital management of spinal cord injuries. Paraplegia 1987;25:229-38. 8. Ray SK, Hogan EL, Banik NL. Calpain in the pathophysiology of spinal cord injury: Neuroprotection with calpain inhibitors. Brain Res Rev 2003;42:169-85. 9. Rossignol S, Schwab M, Schwartz M, Fehlings G. Spinal cord injury: time to move? J Neurosci 2007;27:11782-92. 10. Huang H, Liu H, Yan R, Hu M. PI3K/Akt and ERK/MAPK signaling promote different aspects of neuron survival and axonal regrowth following, rat facial nerve axotomy. Neurochem Res 2017;42:3515-24. 11. Xu B, Chen S, Luo Y, Chen Z, Liu L, et al. Calcium signaling is involved in cadmium-induced neuronal apoptosis via induction of reactive oxygen species and activation of MAPK/mTOR network. PLoS One 2011;6:e19052. 12. McAndrew CW, Gastwirt RF, Donoghue DJ. The atypical CDK activator Spy1 regulates the intrinsic DNA damage response and is dependent upon p53 to inhibit apoptosis. Cell Cycle 2009;8:66-75. 13. Yıldız Ünal A, Korulu Ş, Karabay A. SpeedyRINGO inhibits calpain-directed apoptosis in neurons. J Alzheimers Dis 2012;31:779-91. 14. Wang XD, Zhu MW, Shan D, Wang SY, Yin X, et al. Spy1, a unique cell cycle regulator, alters viability in ALS motor neurons and cell lines in response to mutant SOD1-induced DNA damage. DNA Repair (Amst) 2019;74:51-62. 15. Huang Y, Liu Y, Chen Y, Yu X, Yang J, et al. Peripheral nerve lesion induces an up-regulation of Spy1 in rat spinal cord. Cell Mol Neurobiol 2009;29:403-11. 16. Golipour A, Myers D, Seagroves T, Murphy D, Evan GI, et al. The Spy1/RINGO family represents a novel mechanism regulating mammary growth and tumorigenesis. Cancer Res 2008;68:3591-600. 17. Liu ML, Cheng YM, Jia MC. LM23 is essential for spermatogenesis in Rattus norvegicus. Front Biosci 2010;2:187-94. 18. Liu P, Begley M, Michowski W, Inuzuka H, Ginzberg M, et al. Cell-cycle-regulated activation of Akt kinase by phosphorylation at its carboxyl terminus. Nature 2014;508:541-5. 19. Platt SR. The role of glutamate in central nervous system health and disease-a review. Vet J 2007;173:278-86. 20. Gagliardi RJ. Neuroprotection, excitotoxicity and NMDA antagonists. Arq Neuropsiquiatr 2000;58:583-8. 21. Berliocchi L, Bano D, Nicotera P. Ca2+ signals and death programmes in neurons. Philos Trans R Soc Lond B Biol Sci 2005;360:2255-8. 22. Wong PC, Cai H, Borchelt DR, Price DL. Genetically engineered mouse models of neurodegenerative diseases. Nat Neurosci 2002;5:633-9. 23. Anderson CNG, Tolkovsky AM. Role for MAPK/ERK in sympathetic neuron survival: protection against a p53-Dependent, JNK-Independent Induction of Apoptosis by Cytosine Arabinoside. J Neurosci 1999;19:664-73. 24. Institute of Medicine. Spinal cord injury: progress, promise, and priorities Washington, DC: The National Academies Press; 2005. 25. Choi DW. Methods for antagonizing glutamate neurotoxicity. Cerebrovasc Brain Metab Rev 1990;2:105-14732. 26. Du S, Rubin A, Klepper S, Barrett C, Kim YC, et al. Calcium influx and activation of Calpain I mediate acute reactive gliosis in injured spinal cord. Exp Neurol 1999;157:96-105. 27. Beirowski B, Adalbert R, Wagner D, Grumme DS, Addicks K, et al. The progressive nature of Wallerian degeneration in wild-type and slow Wallerian degeneration (WldS) nerves. BMC Neurosci 2005;6:6. 28. Emery E, Aldana P, Bunge MB, Puckett W, Srinivasan A, et al. Apoptosis after traumatic human spinal cord injury. J Neurosurg 1998;89:911-20. 29. Mizuno Y, Mochizuki H, Sugita Y, Goto K. Apoptosis in neurodegenerative disorders. Intern Med 1998;37:192-3. 30. Das A, Smith JA, Gibson C, Varma AK, Ray SK, et al. Estrogen receptor agonists and estrogen attenuate TNF-alpha-induced apoptosis in VSC4.1 motoneurons. J Endocrinol 2011;208:171-82. 31. Samantaray S, Sribnick EA, Das A, Knaryan VH, Matzelle D, et al. Melatonin attenuates calpain upregulation, axonal damage and neuronal death in spinal cord injury in rats. J Pineal Res 2008;44:348-57. 32. Das A, McDowell M, Pava MJ, Smith JA, Reiter RJ, et al. The inhibition of apoptosis by melatonin in VSC4.1 motoneurons exposed to oxidative stress, glutamate excitotoxicity, or TNF-alpha toxicity involves membrane melatonin receptors. J Pineal Res 2010;48:157-69. 33. Ray SK, Hogan EL, Banik NL. Calpain in the pathophysiology of spinal cord injury: neuroprotection with calpain inhibitors. Brain Res Rev 2003;42:169-85. 34. Samantaray S, Sribnick EA, Das A, Thakore NP, Matzelle D, et al. Neuroprotective efficacy of estrogen in experimental spinal cord injury in rats. Ann N Y Acad Sci 2010;1199:90-4. 35. Bracken MB. Steroids for acute spinal cord injury. Cochrane Database Syst Rev 2012;1:CD001046. 36. Sribnick EA, Wingrave JM, Matzelle DD, Wilford GG, Ray SK, et al. Estrogen attenuated markers of inflammation and decreased lesion volume in acute spinal cord injury in rats. J Neurosci Res 2005;82:283-93. 37. Wingrave JM, Schaecher KE, Sribnick EA, Wilford GG, Ray SK, et al. Early induction of secondary injury factors causing activation of calpain and mitochondria-mediated neuronal apoptosis following spinal cord injury in rats. J Neurosci Res 2003;73:95-104. 38. Mazzone GL, Nistri A. Delayed neuroprotection by riluzole against excitotoxic damage evoked by kainate on rat organotypic spinal cord cultures. Neuroscience 2011;190:318-27. 39. Rong W, Wang J, Liu X, Jiang L, Wei F, et al. 17 beta-estradiol attenuates neural cell apoptosis through inhibition of JNK phosphorylation in SCI rats and excitotoxicity induced by glutamate in vitro. Int J Neurosci 2012;122:381-7. 40. Bains M, Hall ED. Antioxidant therapies in traumatic brain and spinal cord injury. Biochim Biophys Acta 2012;1822:675-84. 41. Robert AA, Zamzami M, Sam AE, Al Jadid M, Al Mubarak S. The efficacy of antioxidants in functional recovery of spinal cord injured rats: an experimental study. Neurol Sci 2012;33:785-91. 42. Bo W, Ren XJ. Control of demyelination for recovery of spinal cord injury. Chin J Traumatol 2008;11:306-10. 43. Borisoff JF, Chan CC, Hiebert GW, Oschipok L, Robertson GS, et al. Suppression of Rho-kinase activity promotes axonal growth on inhibitory CNS substrates. Mol Cell Neurosci 2003;22:405-16. 44. Ferrari G, Fabris M, Gorio A. Gangliosides enhance neurite outgrowth in PC12 cells. Brain Res 1983;284:215-21. 45. Gonzenbach RR, Schwab ME. Disinhibition of neurite growth to repair the injured adult CNS: focusing on Nogo. Cell Mol Life Sci 2008;65:161-76. 46. Gorio A, Ferrari G, Fusco M, Janigro D, Zanoni R, et al. Gangliosides and their effects on rearranging peripheral and central neural pathways. Cent Nerv Syst Trauma 1984;1:29-37. 47. Liu BP, Cafferty WB, Budel SO, Strittmatter SM. Extracellular regulators of axonal growth in the adult central nervous system. Philos Trans R Soc Lond B Biol Sci 2006;361:1593-610. 48. Schwab ME. Nogo and axon regeneration. Curr Opin Neurobiol 2004;14:118-24. 49. Yiu G, He Z. Glial inhibition of CNS axon regeneration. Nat Rev Neurosci 2006;7:617-27. 50. Karimi-Abdolrezaee S, Billakanti R. Reactive astrogliosis after spinal cord injury-beneficial and detrimental effects. Mol Neurobiol 2012;46:251-64. 51. Dergham P, Ellezam B, Essagian C, Avedissian H, Lubell WD, et al. Rho signaling pathway targeted to promote spinal cord repair. J Neurosci 2002;22:6570-7. 52. Dubreuil CI, Winton MJ, McKerracher L. Rho activation patterns after spinal cord injury and the role of activated Rho in apoptosis in the central nervous system. J Cell Biol 2003;162:233-43. 53. Jalink K, van Corven EJ, Hengeveld T, Morii N, Narumiya S, et al. Inhibition of lysophosphatidate- and thrombin-induced neurite retraction and neuronal cell rounding by ADP ribosylation of the small GTP-binding protein Rho. J Cell Biol 1994;126:801-10. 54. Lord-Fontaine S, Yang F, Diep Q, Dergham P, Munzer S, et al. Local inhibition of Rho signaling by cell-permeable recombinant protein BA-210 prevents secondary damage and promotes functional recovery following acute spinal cord injury. J Neurotrauma 2008;25:1309-22. 55. Sung JK, Miao L, Calvert JW, Huang L, Louis Harkey H, et al. A possible role of RhoA/Rho-kinase in experimental spinal cord injury in rat. Brain Res 2003;959:29-38. 56. Gu YL, Yin LW, Zhang Z, Liu J, Liu SJ, et al. Neurotrophin expressions in neural stem cells grafted acutely to transected spinal cord of adult rats linked to functional improvement. Cell Mol Neurobiol 2012;32:1089-97. 57. Quertainmont R, Cantinieaux D, Botman O, Sid S, Schoenen J, et al. Mesenchymal stem cell graft improves recovery after spinal cord injury in adult rats through neurotrophic and proangiogenic actions. PLoS One 2012;7:e39500. 58. Uchida K, Nakajima H, Hirai T, Yayama T, Chen K, et al. The retrograde delivery of adenovirus vector carrying the gene for brain-derived neurotrophic factor protects neurons and oligodendrocytes from apoptosis in the chronically compressed spinal cord of twy/twy mice. Spine 2012;37:2125-35. 59. Donnelly EM, Lamanna J, Boulis NM. Stem cell therapy for the spinal cord. Stem Cell Res Ther 2012;3:24. 60. Wang H, Fang H, Dai J, Liu G, Xu ZJ. Induced pluripotent stem cells for spinal cord injury therapy: current status and perspective. Neurol Sci 2013;34:11-7. 61. Beattie MS. Inflammation and apoptosis: linked therapeutic targets in spinal cord injury. Trends Mol Med 2004;10:580-3. 62. Okada S, Nakamura M, Renault-Mihara F, Mukaino M, Saiwai H, et al. The role of cytokine signaling in pathophysiology for spinal cord injury. Inflamm Regen 2008;28:440-6. 63. Ito M, Natsume A, Takeuchi H, Shimato S, Ohno M, et al. Type I interferon inhibits astrocytic gliosis and promotes functional recovery after spinal cordinjury by deactivation of the MEK/ERK pathway. J Neurotrauma 2009;26:41-53. 64. Askvig JM, Watt JA. The MAPK and PI3K pathways mediate CNTF-induced neuronal survival and process outgrowth in hypothalamic organotypic cultures. J Cell Commun Signal 2015;9:217-31. 65. Ray SK, Samantaray S, Smith JA, Matzelle DD, Das A, et al. Inhibition of cysteine proteases in acute and chronic spinal cord injury. Neurotherapeutics 2011;8:180-6. 66. Samantaray S, Smith JA, Das A, Matzelle DD, Varma AK, et al. Low dose estrogen prevents neuronal degeneration and microglial reactivity in an acute model of spinal cord injury: effect of dosing, route of administration, and therapy delay. Neurochem Res 2011;36:1809-16. 67. Lee JY, Choi SY, Oh TH, Yune TY. 17 beta-estradiol inhibits apoptotic cell death of oligodendrocytes by inhibiting rhoA-JNK3 activation after spinal cord injury. Endocrinology 2012;153:3815-27. 68. Bonnefont-Rousselot D, Collin F, Jore D, Gardes-Albert M. Reaction mechanism of melatonin oxidation by reactive oxygen species in vitro. J Pineal Res 2011;50:328-35. 69. Wu UI, Mai FD, Sheu JN, Chen LY, Liu YT, et al. Melatonin inhibits microglial activation, reduces pro-inflammatory cytokine levels, and rescues hippocampal neurons of adult rats with acute Klebsiella pneumoniae meningitis. J Pineal Res 2011;50:159-70. 70. Das A, Wallace G 4th, Reiter RJ, Varma AK, Ray SK, et al. Overexpression of melatonin membrane receptors increases calcium-binding proteins and protects VSC4.1 motoneurons from glutamate toxicity through multiple mechanisms. J Pineal Res 2013;54:58-68. 71. Cheng A, Gerry S, Kaldis P, Solomon MJ. Biochemical characterization of Cdk2-Speedy/Ringo A2. BMC Biochem 2005;6:19. 72. Nebreda AR. CDK activation by non-cyclin proteins. Curr Opin Cell Biol 2006;18:192-8. 73. Bartek J, Lukas J. DNA damage checkpoints: from initiation to recovery or adaptation. Curr Opin Cell Biol 2007;19:238-45. 74. Attardi LD. The role of p53-mediated apoptosis as a crucial anti-tumor response to genomic instability: lessons from mouse models. Mutat Res 2005;569:145-57. 75. Gastwirt RF, Slavin DA, McAndrew CW, Donoghue DJ. Inhibition of apoptosis and checkpoint activation. J Biol Chem 2006;281:35425-35. 76. Dhariwala FA, Rajadhyaksha MS. An unusual member of the cdk family: cdk5. Cell Mol Neurobiol 2008;28:351-69. 77. Yip YP, Capriotti C, Drill E, Tsai LH, Yip JW. Cdk5 selectively affects the migration of different populations of neurons in the developing spinal cord. J Comp Neurol 2007;503:297-307. 78. Fu X, Choi YK, Qu D, Yu Y, Cheung NS, et al. Identification of nuclear import mechanisms for the neuronal Cdk5 activator. J Biol Chem 2006;281:39014-21. 79. Cruz JC, Tsai LH. Cdk5 deregulation in the pathogenesis of Alzheimer’s disease. Trends Mol Med 2004;10:452-8. 80. Zhang J, Krishnamurthy PV, Johnson GVW. Cdk5 phosphorylates p53 and regulates its activity. J Neurochem 2002;81:307-13. 81. Sedarous M, Keramaris E, O’Hare M, Melloni E, Slack RS, et al. Calpains mediate p53 activation and neuronal death evoked by DNA damage. J Biol Chem 2003;278:26031-8. 82. Wu GS. The functional interactions between the p53 and MAPK signaling pathways. Cancer Biol Ther 2004;3:156-61. 83. Riley T, Sontag E, Chen P, Levine A. Transcriptional control of human p53regulated genes. Nat Rev Mol Cell Biol 2008;9:402-12. 84. Menendez D, Inga A, Resnick MA. The expanding universe of p53 targets. Nat Rev Cancer 2009;9:724-37. 85. McCubrey JA, Linda S, Terrian DM, Milella M, Tafuri A, et al. Roles of the RAF/MEK/ERK pathway in cell growth, malignant transformation and drug resistance. Biochim Biophys Acta 2007;1773:1263-84. 86. Sawe N, Steinberg G, Zhao H. Dual roles of the MAPK/ERK1/2 cell signaling pathway after stroke. J Neu rosci Res 2008;86:1659-69. 87. She QB, Bode AM, Ma WY, Chen NY, Dong Z. Resveratrol_induced activation of p53 and apoptosis is mediated by extracellular_signal_regulated protein kinases and p38 kinase. Cancer Res 2001;61:1604-10. 88. Duan WJ, Li QS, Xia MY, Tashiro S, Onodera S, et al. Silibinin activated p53 and induced autophagic death in human fibrosarcoma HT1080 cells via reactive oxygen species p38 and C-Jun N-terminal kinase pathways. Biol Pharm Bull 2011;34:47-53. 89. Xiao Y, Yan W, Lu L, Wang Y, Lu W, et al. p38/p53/miR-200a-3p feedback loop promotes oxidative stress-mediated liver cell death. Cell Cycle 2015;14:1548-58. 90. Persons DL, Yazlovitskaya EM, Pelling JC. Effect of extracellular signal-regulated kinase on p53 accumulation in response to cisplatin. J Biol Chem 2000;275:35778-85. 91. Kaji A, Zhang Y, Nomura M, Bode AM, Ma WY, et al. Pifithrin-alpha promotes p53- mediated apoptosis in JB6 cells. Mol Carcinog 2003;37:138-48. 92. Lin T, Mak NK, Yang MS. MAPK regulate p53 dependent cell death induced by benzo[a]pyrene: involvement of p53 phosphorylation and acetylation. Toxicology 2008;247:145-53. 93. Drosten M, Sum EY, Lechuga CG, Simón Carrasco L, Jacob HK, et al. Loss of p53 induces cell proliferation via Ras-independent activation of the Raf/Mek/Erk signaling pathway. Proc Nat Acad Sci U S A 2014;111:15155-60. 94. Singh S, Upadhyay AK, Ajay AK, Bhat MK. p53 regulates ERK activation in carboplatin induced apoptosis in cervical carcinoma: a novel target of p53 in apoptosis. FEBS Lett 2007;581:289-95. 95. Lee SY, Shin SJ, Kim HS. ERK1/2 activation mediated by the nutlin-3-induced mitochondrial translocation of p53. Int J Oncol 2013;42:1027-35. 96. Ongusaha PP, Kim JI, Fang L, Wong TW, Yancopoulos GD, et al. p53 induction and activation of DDR1 kinase counteract p53-mediated apoptosis and influence p53 regulation through a positive feedback loop. EMBO J 2003;22:1289-301. 97. Bermudez O, Jouandin P, Rottier J, Bourcier C, Pagès G, et al. Post-transcriptional regulation of the DUSP6/MKP3 phosphatase by MEK/ERK signaling and hypoxia. J Cell Physiol 2011;226:276-84. 98. Zhang H, Chi Y, Gao K, Zhang X, Yao J. p53 protein-mediated upregulation of MAP kinase phosphatase 3 (MKP3) contributes to the establishment of the cellular senescent phenotype through dephosphorylation of extracellular signalregulated kinase 1/2 (ERK1/2). J Biol Chem 2015;290:1129-40. 99. Franke TF, Kaplan DR, Cantley LC. PI3K: downstream AKT action blocks apoptosis. Cell 1997;88:435-7. 100. Wymann MP, Pirola L. Structure and function of phosphoinositide 3-kinases. Biochim Biophys Acta 1998;1436:127-50. 101. Datta SR, Brunet A, Greenberg ME. Cellular survival: a play in three Akts. Genes Dev 1999;13:2905-27. 102. Sabbatini P, McCormick F. Phosphoinositide 3-OH kinase (PI3K) and PKB/Akt delay the onset of p53-mediated, transcriptionally dependent apoptosis. J Biol Chem 1999;274:24263-9. 103. Henry MK, Lynch JT, Eapen AK, Quelle FW. DNA damage-induced cell-cycle arrest of hematopoietic cells is overridden by activation of the PI-3 kinase/Akt signaling pathway. Blood 2001;98:834-41. 104. Cantley LC, Neel BG. New insights into tumor suppression: PTEN suppresses tumor formation by restraining the phosphoinositide 3-kinase/AKT pathway. Proc Natl Acad Sci 1999;96:4240-5. 105. Ramaswamy S, Nakamura N, Vazquez F, Batt DB, Perera S, et al. Regulation of G1 progression by the PTEN tumor suppressor protein is linked to inhibition of the phosphatidylinositol 3-kinase/Akt pathway. Proc Natl Acad Sci 1999;96:2110-5. 106. Rossignol S, Schwab M, Schwartz M, Fehlings MG. Spinal cord injury: time to move? J Neurosci 2007;27:11782-92. 107. Van den Berg ME, Castellote JM, Mahillo-Fernandez I, dePedro-Cuesta J. Incidence of spinal cord injury worldwide: a systematic review. Neuroepidemiology 2010;34:184-92.